Security forces arrest, interrogate, 26 terrorists and 12 violent rioters. 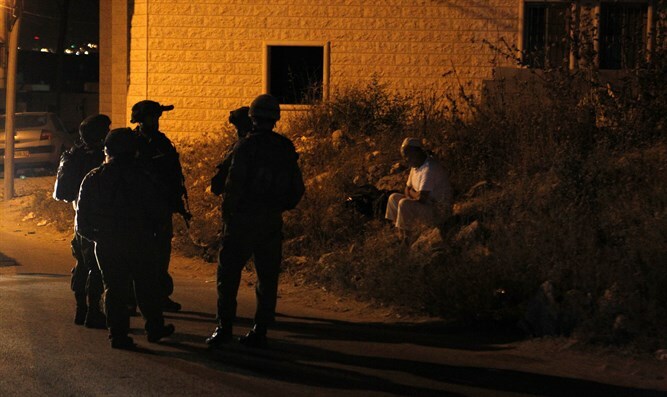 Soldiers in the IDF's Menashe Brigade, working with Border Police and Israel Police, on Sunday night arrested 12 Palestinian Arabs suspected of rioting and participating in violent disturbances over the past few weeks. The operation focused on the area around Tulkarem, one of the major "terror capitals." An IDF spokesman noted that all those arrested are suspected of throwing rocks and firebombs at IDF forces. In a separate mission, Israel Police, Border Police, Shabak (Israel Security Agency), and IDF soldiers arrested 26 wanted terrorists in Judea and Samaria. All of them are suspected of involvement in terror activities, "lone wolf" terror attacks, and violent disturbances of the peace aimed at harming Israeli civilians and security forces. All those arrested were taken for interrogation by Israeli security forces. Earlier, an IDF soldier was lightly injured when an Arab rioter in the Samaria region's Arab town of Kafr Halat el-Amud threw a rock at him. The soldier was transferred for medical treatment.